This small sculpture in wood conveys the aesthetic essence of fine Kashmiri bronze-casting, which was greatly esteemed by the kings of western Tibet from the mid-tenth to eleventh centuries. The tall body is handsome, strong, and gentle. The athletic musculature of the chest and cinched waist reflect Kashmiri prototypes, as does the posture with a bend at the hip to balance firmly on the left foot. In fact, it is hard to be certain whether this is the work of a Kashmiri or western Tibetan sculptor. 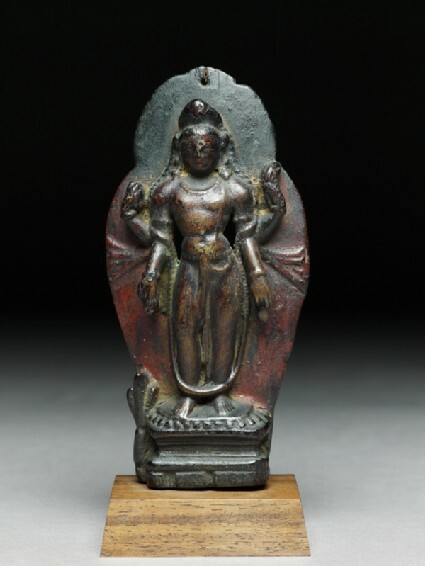 However, the medium of wood and the elegant simplicity of the statue suggest a provenance from west Tibet, since Kashmiri sculptors tended to work in metal, specializing in copper and silver inlays for fabric and jewellery. Here the clothing is barely suggested, and the jewellery comprises only a single strand for the necklace and belt, as well as bracelets and armbands. Wood is an uncommon medium for portable sculptures of deities in the Himalayan region, even though many small carved wooden figures are found in the lintels of chapels or on the exterior facades of monasteries. Wood was however also used to make portable shrines, with a central niche to contain the image of a deity . When isolated from an architectural context, such figures are very light and fragile, and thus very few ancient wooden statues are extant today . The identification of this figure as Maitreya is based on the elongated form of the flower in the upper left hand . This flower is the nagakesara or the campaka, rather than the round padma lotus held by Avalokitesvara . Otherwise, these two Bodhisattvas may both carry the water pot in the lower left hand, prayer beads in the upper right hand, and make the varada mudra of boon-bestowing with the lower right hand. A further argument in favour of Maitreya is the gold tint to his body, for gold is the colour most frequently associated with this Bodhisattva, while Avalokitesvara is usually white. At the front of the coiffure, one might expect to see a stupa confirming the identification as Maitreya, but this is now too worn to be identifiable. The prabha behind the statue bears red pigment, especially visible towards the lotus section above the plinths of the base. Despite the wear to the face, the rounded oval shape and broad planes with a gentle expression are still visible. Traces of paint for the eyebrows can be seen. Although muscular emphasis is clear, the smooth carving of the wood is such that the strong shoulders and abdomen do not appear rigid, and there is a softness to the image which is part of its appeal. In Mulbek, Ladakh, a life-sized male statue is carved in the rock, most recently attributed to the tenth to eleventh century. This sculpture also has four arms and shares the same attributes as the Ashmolean figure. Moreover, the unusual streamers extending beyond the prabha at waist level of the Ashmolean Bodhisattva are carved in the rock figure as well. This is certainly indicative of a regional style of garment specific to the western Himalaya . Between the eleventh and thirteenth centuries, western Tibetan sculptors often produced images inspired by Kashmiri aesthetic models. The form of the prabha which combines a circular halo around the head, tapering to a point at the apex, with an elliptical body halo, widest at the shoulders, is found in several sculptures in metal attributed to Kashmir or western Tibet in the eleventh century . Here one may note the small apertures at either side of the body, which successfully emphasize the subtle modelling of the torso and hips. This is perhaps a borrowing from Pala sculptors also working in west Tibet. Prabhas of similar shape surround several clay moulded sculptures (tsa tsa) used as consecration contents of the seated Buddha (cat. 52), attributed to western Tibet in the twelfth to thirteenth century. These factors all suggest a provenance of western Tibet, possibly Ladakh, in about the eleventh century for this elegant Maitreya. 1 Giuseppe Tucci discovered a 7th-8th-century Kashmiri wooden shrine at Tsaparang, illus. Snellgrove, The Image of the Buddha, pl. 252. A shrine for Tara attributed to eleventh-century western Tibet or Himachal Pradesh (h. 45.1 cm), is now in the Kronos collection, illus. Pal, The Art and Architecture of Ancient Kashmir, pl. 7, p. 121. 2 See Snellgrove and Skorupski, The Cultural Heritage of Ladakh, vol. 2, pls. 20, 24, for two wooden sculptures of Bodhisattvas at Sumda, with very similar necklace and chest muscles, attributed to c. 1000 ad. 3 Luczanits, Buddhist Sculpture in Clay, fig. 231, where this statue is identified as Maitreya. It had previously been identified as Avalokitesvara, in Casey, Beyond Lhasa: Sculpture and Painting from East and West Tibet, pl. 1. 4 According to M. T. de Mallmann, the name of the flower is an epithet: nagapushpa or nagakesara is the flower of the bodhi tree of the future Buddha Maitreya, while the Tibetan name for Maitreya, Byams pa, 'the Loving One', has given rise to the name campaka for this elongated flower: see de Mallman, Introduction a l'iconographie du tantrisme bouddhique, p. 235 and ns.14-15. 5 Pal, op. cit., pl. 4, p. 19 (tenth century, attributed to Ladakhi sculptors); Snellgrove and Skorupski, The Cultural History of Ladakh, vol. 1, pl. 4, attributed to the seventh century or later. 6 Pal, op. cit., p. 120, pls. 10-11.